Members of the Kosmos Society have been reading sections of Xenophon’s Anabasis, and this post provides a brief historical context to that work. The text is available on Perseus, both in Greek and in an English translation by Carleton L. Brownson (1922). The Anabasis by the Athenian soldier, historian and philosopher Xenophon, also known as The Anabasis of Cyrus, The March of the Ten Thousand and The March Up-Country, describes the events of 401 BCE when ten thousand Greek mercenaries joined the army of Cyrus, the younger brother of the Persian King Artaxerxes, in Cyrus’ attempt to supplant his brother as king. In the Anabasis, Xenophon, who began the campaign as a cavalryman and later became one of the Greek mercenaries’ generals, describes the genesis of Cyrus’ revolt, the march deep into the Persian empire, the subsequent victorious battle of Cunaxa at which Cyrus died, and the difficult journey of the ten thousand Greek hoplite mercenaries as they fought their way north to the Black Sea and freedom. The events described in the Anabasis were both an outgrowth of the Peloponnesian War between Athens and Sparta, and a precursor, as it were, of the much later Anabasis of Alexander (the Great) as described by the writer Arian. During the final phase of the Peloponnesian War, from 413 BCE after Athens’ terrible losses in the Sicilian campaign at Syracuse until its final defeat in 404 BCE by Sparta (known as “The Ionian War”) Sparta attempted to destroy Athens’ sea power in the Aegean Sea and bring about the revolt of the subjects cities of the Athenian Empire, promising the cities “freedom” in return. To do so, Sparta needed a navy, in fact multiple navies, as Athens succeeded in destroying many Spartan fleets before its ultimate collapse. Since Sparta had neither the manpower nor the funds to develop fleets on its own, it sought an alliance with the Persian Empire. Funds were provided by the coastal satraps Pharnabasus and Tissaphernes, in return for Sparta’s agreement to allow Persia to reclaim control of the cities of Ionia, which had been lost during the Persian Wars. So much for the “freedom of Greece”. Initially backing Sparta, the Persian satraps’ interest vacillated, with Tissaphernes determined to back Sparta just enough that Sparta and Athens would wear each other out. 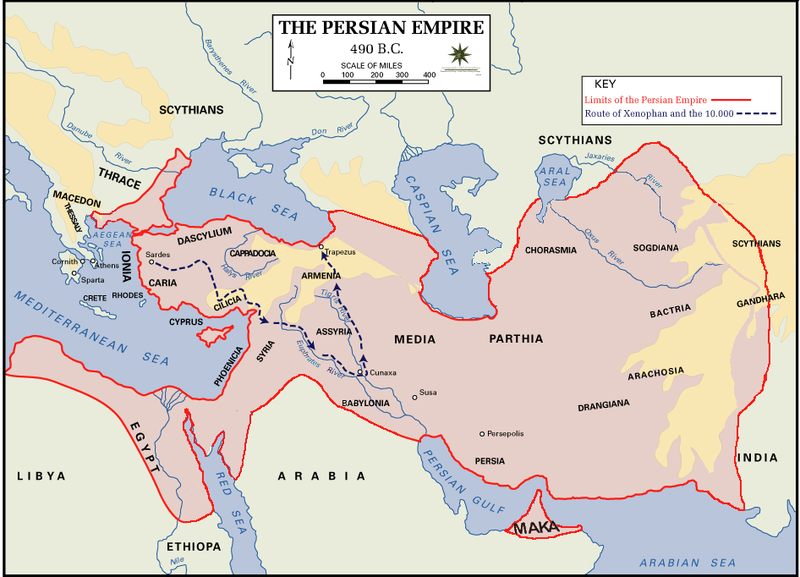 This changed when in 407 BCE the Persian king Darius II replaced the two coastal satraps with his son Cyrus in order to end the war with a Spartan victory. Cyrus and the newly assigned Spartan admiral in the Aegean, Lysander, saw the war in a similar way, and both being young and ambitious, became friends. With funds flowing freely, Sparta was able to build the ships and hire the rowers which ultimately led to Athens’ defeat in 404 BCE. The Persian king Darius also died in 404, and his elder son Artaxerxes II gained the throne. His brother Cyrus, satrap of Lydia, was dissatisfied with the result, and sought Spartan help in his revolt against the king. Here, Darius II’s decision to completely back Sparta versus the more balanced approach of Tissaphernes came back to haunt his son Artaxerxes, as the Spartans agreed to help Cyrus. In the aftermath of the Peloponnesian War, with the dislocations caused by thirty years of war and civil war among many Greek poleis, there were thousands of former soldiers throughout Greece, including many hoplite heavy infantry, with no prospect of land, an income or employment. Under the Spartan Clearchus, a former general, Cyrus was able to recruit ten thousand hoplites to form the backbone of his army. Thálatta! Thálatta! (Greek: Θάλαττα! θάλαττα! ; “The Sea! The Sea!”), from the Anabasis of Xenophon. 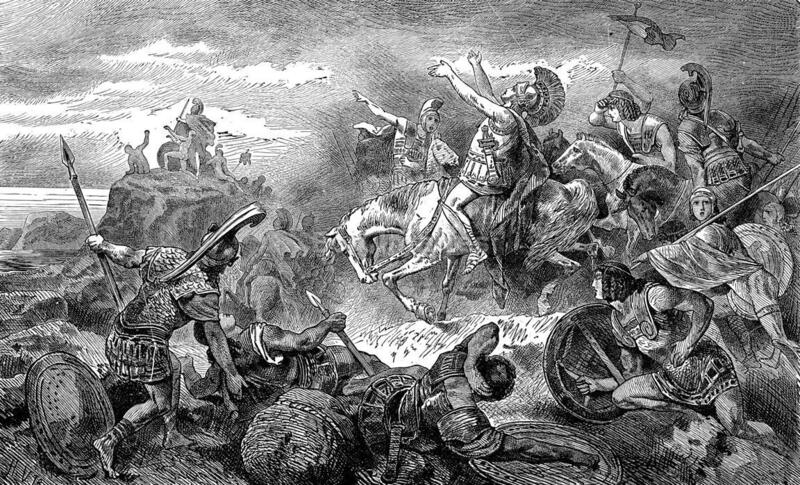 19th-century illustration, “The Return of the Ten Thousand under Xenophon.” Greek mercenary forces (including Xenophon, who recorded the event) march home after their defeat at the Battle of Cunaxa in 401 B.C. Once Xenophon and the six thousand remaining hoplites reached the Black Sea and returned to the mainland, all Greece took notice. It was clear that by being unable to destroy a relatively small Greek force and unable to prevent its thousand-mile journey through the heart of the empire, the Persian king was nowhere near as formidable as was previously believed. In the short run, that knowledge caused the Spartan king Agesilaus to invade Asia, and in the longer term, gave Alexander the Great the confidence to begin his invasion of Persia seventy years later. Map, Persian Empire, 490 BCE, showing route of Cyrus the Younger, Xenophon and the 10.000. The Department of History, United States Military Academy, via Wikimedia Commons. Public domain. Herman Vogel, Thálatta! Thálatta! (Greek: Θάλαττα! θάλαττα! ; “The Sea! The Sea!”), from the Anabasis of Xenophon. Heroic march of the Ten Thousand Greek mercenaries. 19th-century illustration “The Return of the Ten Thousand under Xenophon.” via Wikimedia Commons, public domain. Ian Joseph is a retired finance executive with an interest in ancient Greek history and literature. He received a BA in cultural anthropology from the University of Chicago and an MBA from Pepperdine University.